As advanced, industrialised democracies, the EU and Japan have many common interests, and cooperate closely with one another in international and multilateral fora such as the UN, WTO, and the G7 and G20. The scope of the overall relationship has broadened in recent years and now goes far beyond the earlier trade-related focus of the 1970s and 1980s. 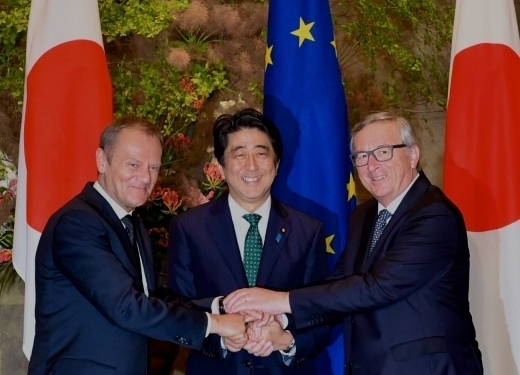 Building on shared fundamental values, the EU established a Strategic Partnership with Japan in 2001, and top leaders meet at the annual EU-Japan Summit since 1991. - A Strategic Partnership Agreement, a legally binding pact covering not only political dialogue and policy cooperation, but also cooperation on regional and global challenges, including environment and climate change, development policy and disaster relief, and security policy. Alongside negotiations towards the new agreements, the EU and Japan continue to hold regular dialogue meetings on a variety of policy areas such as the environment, information society, cyber-space, science & technology, trade, financial services and industrial policy. Additionally, the EU and Japan have a regular dialogue on human rights and cooperate in various forums, such as the UN Human Rights Council and in the UN 3rd Committee. This very practical co-operation across a variety of policy fields helps iron out potential problems, and contributes to establishing international norms. The European Union has had a diplomatic office in Japan for 40 years now. In 1974, what was then the European Communities opened the first Delegation in Tokyo, and this has since evolved to become the Delegation of the European Union with the Lisbon Treaty, which entered into force in December 2009. During the 1970s and 1980s, the focus of our bilateral efforts was not only to correct the trade imbalance, but also to broaden industrial cooperation and investment. 1987 saw the creation of what is now known as the EU-Japan Centre for Industrial Cooperation. More exchanges among academics, journalists and researchers were encouraged. Bilateral ties strengthened in the 1990s, after a series of European Treaties made it clear that Europe was heading toward deeper economic and political integration, and policymakers in both Europe and Japan were increasingly aware that a closer partnership between these large economies and like-minded, mature democracies would benefit not only each other, but the world as a whole. The 2009 Lisbon Treaty saw the establishment of the EU’s own diplomatic service, and this has led to an intensification of political dialogue and the first regular consultations on security policy issues.